On June 11th, 2008, NASA launched the Fermi Gamma-ray Telescope to scan the cosmos for things like active galactic nuclei, pulsars, and gamma ray bursts. To celebrate a decade of Fermi’s studies, last week NASA announced a new set of modern constellations discovered with the telescope. 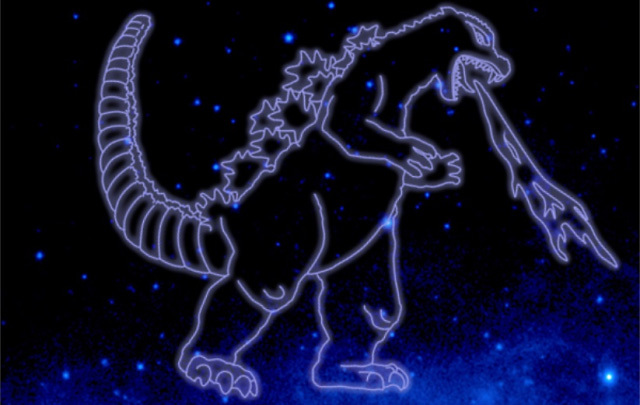 Echoing the way existing constellations were named by ancient Greek astronomers based on heroes from Greek mythology, NASA decided to name their new constellations based on characters of modern sci-fi and fantasy… including Japan’s very own Godzilla. The Godzilla constellation is not composed of stars and galaxies which can be seen with the naked eye at night, but of phenomena which can only be identified with an instrument like the Fermi which scans for gamma rays. 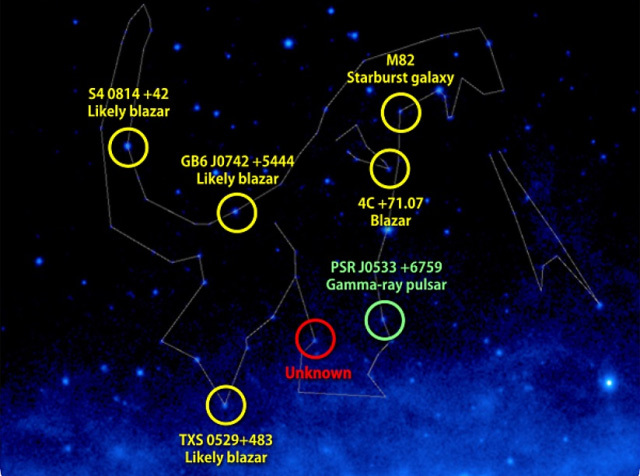 Such gamma ray sources run the gamut of creation and destruction; from super-massive black-holes crushing matter into an energy-rich spinning jet (blazars), to galaxies undergoing a high birth rate of new stars (starburst galaxies). The crowning feature of the Godzilla constellation is a triangular series of gamma ray sources resembling his heat ray breath. A constellation named for Mount Fuji also sits near Godzilla’s feet. Other prominent gamma ray constellations are named after Marvel’s The Hulk, Dr. Who‘s Tardis, and the Starship Enterprise from Star Trek.